The Big Brother Naija 2018 housemates' week was broken down into three appreciation challenges. Yet another stress scented breeze took over as the Housemates were summoned to the arena for yet another round of heavy breathing, deep sighs and waves of anxiety; and as always, Big Brother re-invented himself and brought the Housemates a simple but slightly complex challenge, especially to a blind man. Before the Head of House qualifier however, the Housemates had their week broken down and sub sectioned into stranger than usual challenges. In accordance with the week’s theme, the Housemates are to collectively compose poems for each of the Evicted Housemates, with 3 being presented on the daily. Furthermore, Big Brother gave them a head start advantage by letting them know that they’d have to prepare an appreciation lunch for themselves on Saturday. The most classic of the challenges listed on their brief however was that of the Housemates having to appreciate one another on the horn’s cue. Whenever it sounds, the Housemates are to embrace and serenade each other with compliments, aiming to unify the House. This has already been done and it seems to be having the desired effect as the Housemates are being blatantly honest with their approach. Back to the qualifiers, the pairs lined up and prepared to bring down their pinatas, with one part of the pair refereeing the hitting while their other played ‘batman’ and tried to break the dangling targets open. 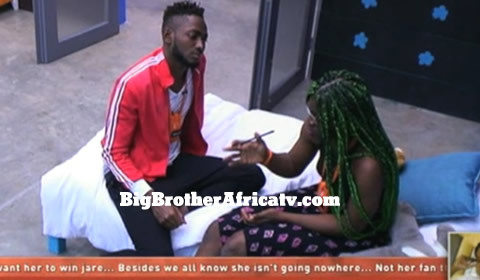 Tobi and Miracle were the first to make it rain, followed by the Miracle and Lolu pair, later joined Cee-C and Nina, who narrowly secured their spot in the final event. Things didn’t turn out as sweetly for Khloe and Anto though because there were the unfortunate pair whose loss will see them sit this one out. With immunity at stake and 6 players gunning for it, it’s anyone’s game really.